Lotte Group Vice Chairman Shin Dong-bin has been promoted to chairman, coming closer to taking the helm at the conglomerate. 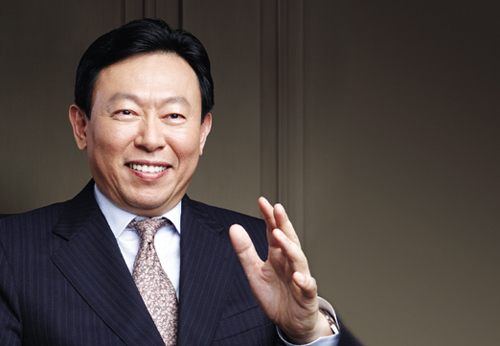 Shin’s promotion to chairman came 21 years after he began his career in the group and 14 years after he was appointed to be vice chairman, despite his father and Lotte Group founder Shin Kyuk-ho’s advanced age of 89. The junior Shin started his management career in 1990 when he was appointed managing director of Honam Petrochemical Corp. In 1997, he was promoted to vice chairman of the corporation. But the founder Shin’s position as chairman in charge of overall affairs remains firm instead of the titular title of honorary chairman, signaling that he would continue to tackle pending issues, shuttling between Korea and Japan and keep his grip on the group, not resigning from his position. Business sources said Vice Chairman Shin Dong-ju, the eldest son of the senior Shin, and Chairman Shin Dong-bin have been groomed to be in charge of Lotte in Japan and Lotte in Korea, respectively. There are many undecided things, however. The size of the group’s businesses in Korea is 10 times as big as that in Japan, and the division of stakes in the group’s subsidiaries between Vice Chairman Shin Dong-ju and Chairman Shin Dong-bin has yet to be decided. For instance, in terms of ownership of Lotte Shopping, Chairman Shin Dong-bin has a 14.59 percent stake,; Vice Chairman Shin Dong-ju holds a 14.58 percent interest,; Hotel Lotte, a 9.5 percent stake,; and Chairman Shin Kyuk-ho has a 1.01 percent stake. The newly installed Chairman Shin has been credited with chalking up a record 61 trillion won in sales in 2010 and tripling revenues in overseas business compared to the previous year, as well as establishing Lotte Group as the fifth largest conglomerate in Korea. The junior Shin himself is the architect of the group’s 2009 vision of becoming one of the top 10 global companies in Asia. The Banghwa Bridge, built by Lotte E&C, is the 27th bridge spanning the Han River, leading to Incheon International Airport.